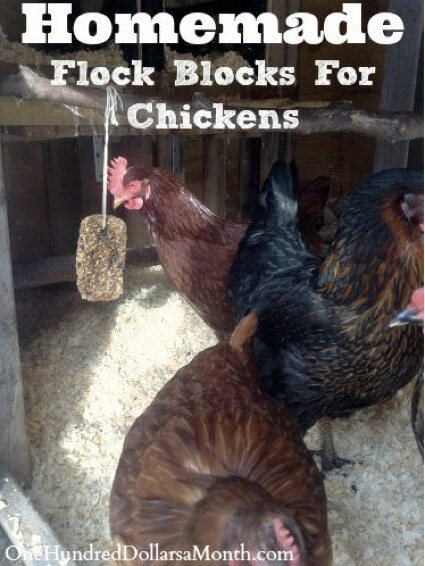 Flock blocks are solid blocks of seeds and grains that typically hang from a sturdy string and are within pecking range for chickens. They offer bored chickens something to peck and eat, often during the winter months when they encounter fewer bugs and weeds in their search, and need more warmth and energy. Bored chickens are prone to pecking each other when boredom sets in, so the flock blocks give them an activity to preoccupy their time. You will save a bit of money making your flock block instead of buying it from a store. As well, homemade flock block will give you peace of mind that that all the ingredients are of quality.